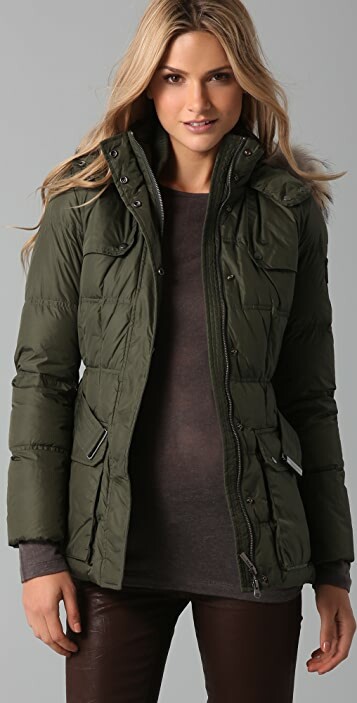 This down-filled puffer coat features fur trim and a 2-snap closure at the removable hood. 8-snap and hidden 2-way zip closures. Welt bust pockets and flap hip pockets. Snap details at storm flap. Removable self-belt. Logo patch at left shoulder. Long sleeves. Lined. * Shell & lining: 100% nylon. * Fill: 100% European goose down. * Fur: Raccoon, imported from Finland. Beautiful! Warm winter coat with a feminine touch. It does run a teeny bit small, but not enough where you'd need to size up. Absolutely love this parka! It runs a teeny bit small, but not to where you need to size up. The fur detail is beautiful and adds a feminine touch. Finally a warm coat that's figure flattering! I own a number of winter coats (I confess) and this has become my new favorite. Not too bulky, but plenty warm. I love the fitted cut of the jacket. I normally wear a XS in tops but had to size up to a S for this coat and even so, it's extremely fitted, especially when it's belted. Winter parkas tend to be just big and bulky, but this one looks and feels trim without sacrificing warmth. This jacket is absolutely awesome! 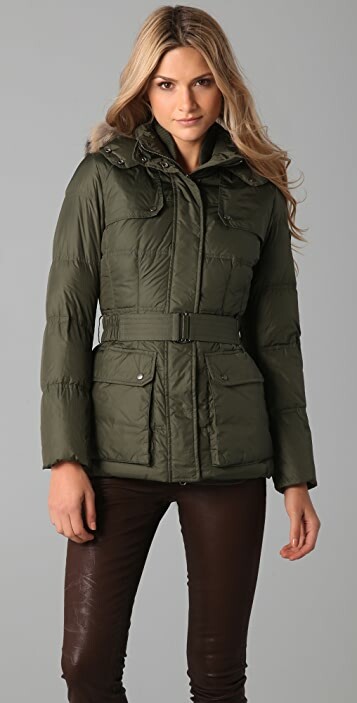 So light and warm,very cute.I highly reccomend this one.If you're not sure about sizing 38-0,40-2,42-4,44-6 and so on.Love this jacket!